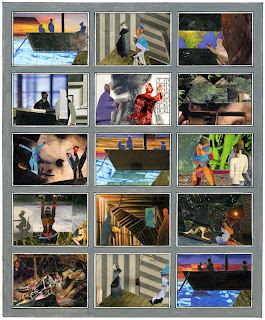 Heart of Darkness storyboard, 2009. Arte Povera is my watchword here since I bring (or have left there from last year) only basic equipment, a box of watercolours, a tube of white gouache, some paste and a bottle of acrylic medium, a few sheets of paper, a ruler and a scalpel, together with a small selection of brushes. Nonetheless it is amazing how in a day or two a neat office can be satisfyingly transformed into a chaotic studio. A single artistic task will do the trick. In this case it was my much delayed response to an ever more insistent request to supply an image to ‘ident’ (as they told me) Heart of Darkness, i.e. to show possible backers "what it would look like". I struggled with the idea; for a theatre production has no visual identity until a director is chosen who then decides on it with his or her set designer. Different direction might set the piece on Mars or Wolverhampton station. Thus I had no image in mind that would allow me to bluff the matter out. However, after a day or two of calm at the Institute for Advanced Study it suddenly occurred to me that a storyboard with key moments pictured in different manners might be the answer. These could be bracketed between the repeated set-ups of the Thames boat (on which Marlow is telling his tale) and the house of Kurz’s ‘intended’ which begin and end the opera; with a reprise of the Thames boat at the centre. In the humanities library a kind librarian provided me with four or five copies of Zeit Magazin which she was about to throw out: these offered just the colours and contrasts I would need for collage. Three days later I had my storyboard complete, like a set of postage stamps. When I got to New York the following Sunday and met up with Tarik, and walked the High Line with Charles and Bob of the American Opera Group everyone seemed happy with it and I could relax and enjoy the excellent crabcakes later served by Suki, our hostess in Washington Square. With the storyboard done I returned to my revisions of A Humument. I have become a visitor to my own website (humument.com) where I can look at the stylish turning-page page-turner made by Alice from the most recent edition. There was a copy of the book only a few yards away in the library but I was pleased to find it to be out on loan. When I started to make my reworkings of all the pages (I am well over half way through the process) the choices were easy since I saw better possibilities in Mallock’s text than I had initially found (sometimes as long as forty years ago). Also new opportunities of relevance have appeared, e.g. how was I to have predicted that the word ‘bush’ would (alas) come in handy? Now I am condemned, as these pages get used up, to stumble on those that still appeal to me yet must, since the rules are the rules, be altered. One such is p.132 where I would have been sorry to part with ‘Mr Glad and his Mrs’. I can however imagine that Mr Glad’s wife passed away in the interim and that he has met a nice widowed lady called Mrs Hope. With a bit of strenuous redrawing, as can be seen here, I can now feature two figures instead of Mr Glad alone while not entirely losing the freshness of that first fine careless rapture. 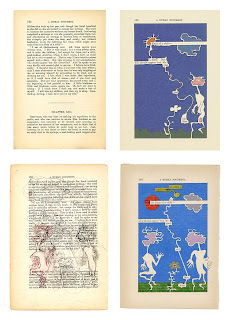 A Humument p132, (clockwise from top L) unworked page, 1973 1st edition, 2009 revision, 2009 working drawing. I well remember loving Mr Glad and his Mrs, so am glad he is happy and hopeful again. I think that's the first time I've been driven to re-read a text by a collage -- wonderfully dark & moody. Love the way the river runs through it.